Are you having lots of company for Thanksgiving dinner? coordinated look for the table(s) used in seating a crowd. tablecloths to use to give the effect that it was one long table. Most of the items on the table had at least touch of gold. That tied all the elements of the table together. Halloween in a couple of different shades of gold. got a quick spritz of spray glitter too. a touch of gold already on them...perfect. down the length of the table(s) to visually tie them together. A long runner would give the same effect. The small votive holders were golden and amber colors. near their base below the silver color higher up. pattern and not a white backside of a turkey place card. she prepared was just divine!!! God with the spectacular sunset out the dining room windows. "Oh give thanks to the Lord, for He is good." 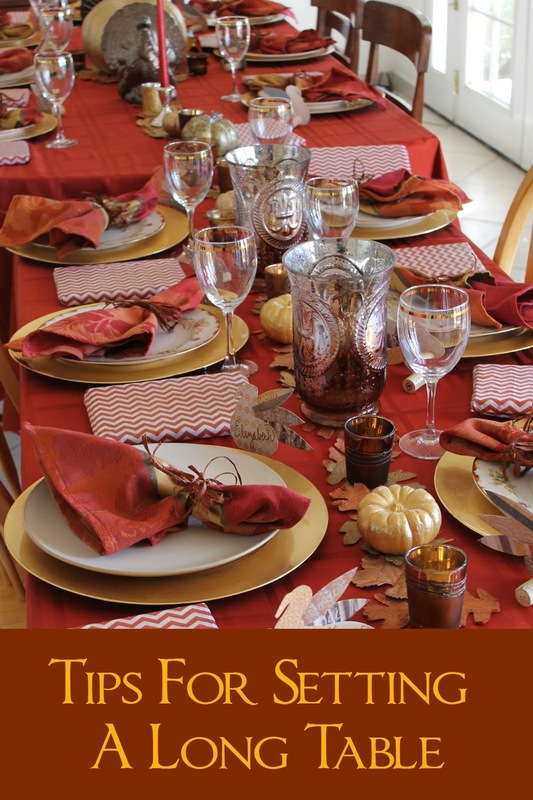 elegant and coordinated look for Thanksgiving or any holiday. What a pretty table setting!! She did a fabulous job making it look like one large table...I love all the pretty accents she added in! Beautiful table! I would say Miss Caroline is a talented hostess. Oh my she really did do a fantastic job. Such a gorgeous table and I love her place settings. Beautifully done. Forgot to say kudos to your daughter-in-law Caroline for the creation of this gorgeous table!! !...I am sure the guests were wowed by this table!! Soooo pretty! Such a blessing to have so many people gathered at one table!